Cook tortellini according to package directions. Meanwhile, in a large saucepan, cook and stir the chicken, bacon and adobo seasoning over medium heat until chicken is no longer pink. Add onion and red pepper; cook and stir until tender. Add garlic; cook 1 minute longer. 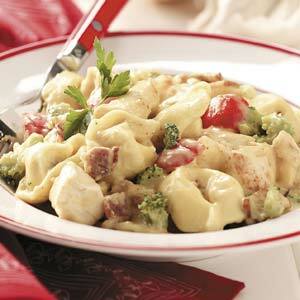 Drain tortellini; add to chicken mixture. Stir in broccoli; heat through. Yield: 3 servings.